The Lenovo Miix runs on Windows 10 Home Edition. 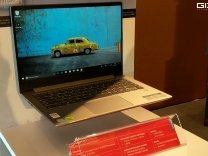 The laptop features a 12.3 inch, WUXGA+ with Corning Glass ,1920x1280 Pixels and is powered by a Qualcomm Snapdragon 835,2.3 GHz with Turbo Boost Upto 2.8 GHz processor. To enhance multi-tasking and fast speed, the company has offered a 8 GB DDR4 RAM. Talking about the storage, the laptop uses a 256GB SSD storage.There is a Light Weight,Quick Charging,Retina Display,Ultra HD and more.The laptop has a Up to 20 hours on a 48Wh battery battery that will give enough battery life to the users. Lenovo has announced the Miix 630, the company's latest Windows 10 S 2-in-1 detachable that delivers the power and productivity of a laptop and the always on, always connected mobility of a smartphone.